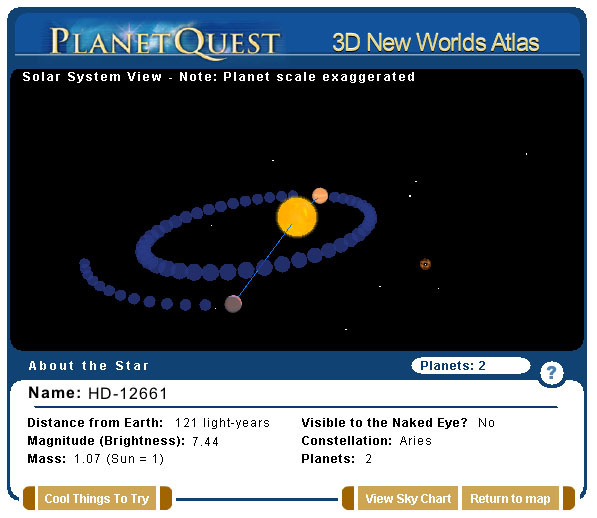 Planetfinder allows users to browse through the data base of star systems with known planets in a compelling 3D interface.. The systems can be filtered based on a variety of criteria (solar mass, stars visible from earth, etc.). Users can even (and this is the cool part), zoom into a chosen system and view the planets as they orbit the star. 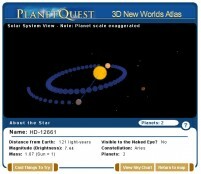 Planetfinder is now being used by NASA’s Planetquest Site under the name 3D New Worlds Atlas. We are currently working on version 2.0. Cick on the link below, keep in mind the presentation may take a moment to load. Once the presentation has started click on the ‘?’ icon for help. This project was not an original idea by any means. The idea originated from the people from NASA’s PlanetQuest website. They were looking for a visual interface to their database of stars. Sounds like a great project, but after the initial discussion the long wait for funding began. I decided to create my own PlanetFinder, to run as a discreet application. What interested me most was the technological challenge. Everyting in PlanetFinder is generated from an external database of stars. With the exception of a few graphics everything is procedurally generated, geometry, textures etc. The result is an online application that has an extremely small footprint, around 98kb. Currently all of the star position data is accurate based on PlanetQuest’s New World Atlas. The good news is that NASA funding has come through and the PlanetQuest Site will have it’s own planet finding tool.